This wind proof 6' Square Fiberglass Umbrella will provide great shade and ambience to your outdoor area for years to come. 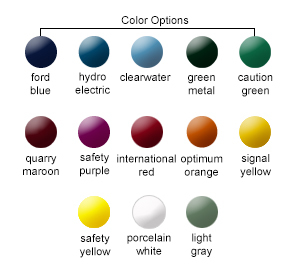 Choose from a wide range of long-lasting colors to match your business' color scheme or opt for the more basic Whalebone color for a slightly more economical option. The attractive color finish on the umbrellas is achieved with a commercial grade two-part (catalyzed) polyurethane paint process, guaranteed not to crack, fade or peel. Both umbrellas come standard with your choice of 6' or 8' pole lengths, in either white or black. All umbrella poles are powder-coated for rust protection, and bolted together with high-grade stainless steel hardware. Replacement umbrella poles are available, as well as angled poles to tilt the umbrella top away from or towards the sun for the desired amount of shade. 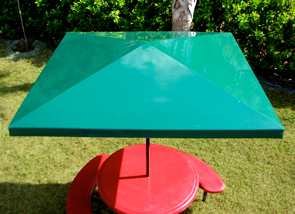 Matching fiberglass tables are suited with a strong umbrella holder to prevent wobbling on windy days.